Inlays and onlays may be made from porcelain or gold. Some consideration must be given to the choice between porcelain and gold, as these material have different advantages. Generally speaking, porcelain offers the best esthetic result if the treatment area is within the "smile zone", while gold offers the most durability and predictability. Porcelain is very resistant to wear, but may cause wear on opposing teeth if a patient chenches or grinds his or her teeth. 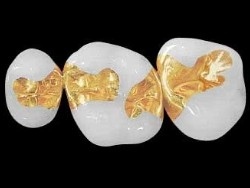 Gold is very gentle to opposing tooth surfaces and requires removal of less tooth structure than does porcelain. Gold, however, does not have the natural tooth color.